family loves Halloween and we love the movie UP, so that's the theme we decided on! We each picked our own characters and ran with it! 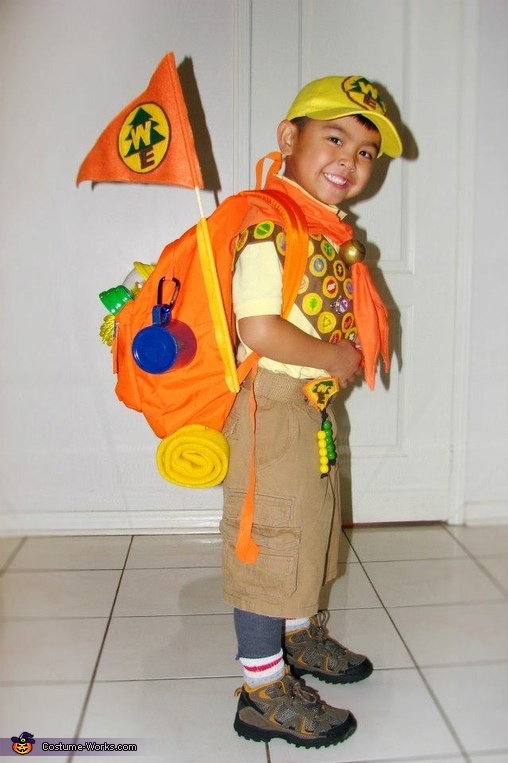 My son wanted to be "Russell" the Wilderness Explorer. He already had the yellow baseball cap, yellow shirt, khaki shorts and hiking boots; so we were half way there. I'm pretty handy with the sewing machine and sewed the rest. Cap: Cut out felt fabric and hand stitched WE logo to front of cap. Backpack: Purchase orange Jansport backpack (on sale! yay!) hand stitched felt fabric logo to front; sewed tabs to back to fasten hooks to attach rope, lantern, mug and other gadgets we had around the house; sewed 2 strips of fabric to bottom of backpack to attach (fake) sleeping back (used folded yellow felt fabric); sewed flag out of felt fabric, attached to wooden dowel and attached to backpack. Badge Sash: Found badges free on-line, printed in colour, laminated, tacked to yellow felt and hand stitched to brown sash that I sewed our of brown cotton fabric. Shirt Logo: Cut out felt fabric, hand stitched to safety pin and pinned to shirt. Shorts Logo: Again made cut out felt fabric, added yellow/green wooden beads strung onto leather string and hand stitched onto safety pin and pinned to shorts. Neck Scarf: Sewed triangle shaped orange cotton fabric and used styrofoam (ball painted gold) to fasten at front.